Schroeder Hall is home to the Department of Criminal Justice Sciences, the Department of History, the Department of Sciology/Anthropology, and the Department of Politics and Government. The building contatins 49 classrooms and office space for 89 faculty members. Schroeder Hall opened in 1957 and was named after Herman Schroeder, Dean of Illinois State from 1928-46. Schroeder was also a Professor of Education and Psychology and was acting President for a short period of time in 1930 when David Felmley fell ill. Schroeder joined Illinois State as a professor in 1913. He prided himself on being thrifty, prompt, and accurate. The clock on the side of Schroeder Hall was dedicated to John F. Kennedy shortly after his assassination in 1963. 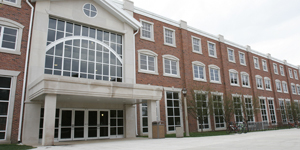 In 1964, a $900,000 addition was also added to Schroeder Hall.